Dermaplaning is a skincare technique that involves using a scalpel, but without making any cuts or incisions in your skin. It’s perfect if you want smooth, silky, younger looking facial skin without surgery. Thanks to Dr. Valerie Barrett and her remarkable team at Renu Medical Aesthetics, dermaplaning is available to residents in Jupiter, Port St Lucie, Tequesta, Palm Beach Gardens, and surrounding Florida cities. 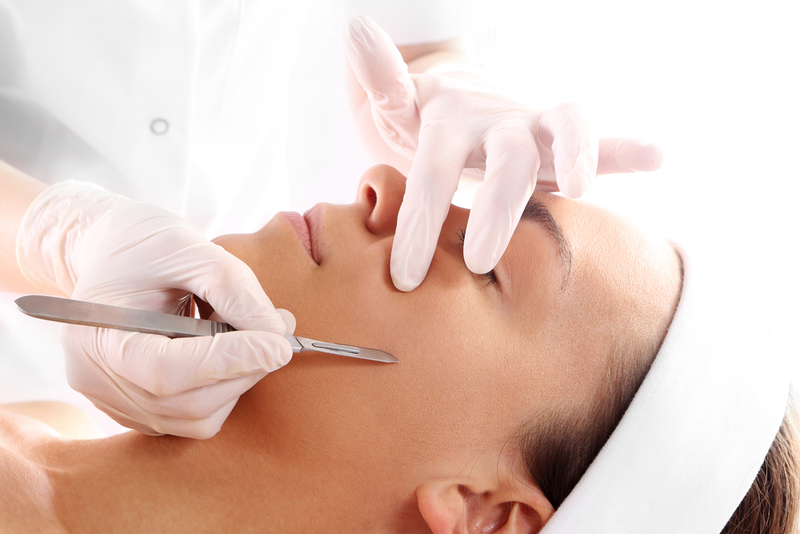 Dermaplaning, in its most basic description, is like shaving. Except, instead of a razor, a sterile, 10-gauge surgical scalpel is used. The skin is pulled taut and the scalpel is scraped, ever-so-gently, upwards across the skin at an angle. It’s considered a form of exfoliation, somewhat like microdermabrasion and the scraping removes a thin layer of dead skin, along with the fine ‘vellus’ hair we all have on our face, commonly known as “peach fuzz”. What can be Treated with Dermaplaning? Dermaplaning is not recommended if you have active pustular acne, vascular lesions, sensitive skin, excessive facial hair or inflammatory skin issues, such as eczema, psoriasis or rosacea. It’s exceptionally effective if you have dry, rough or aging skin. Dermaplaning is also a good choice for pregnant or lactating women who are not candidates for chemical peels. If you’re a healthy adult and want the smoothest, silkiest skin possible, dermaplaning may be precisely what you need. It works very well on most skin types, textures and color. What Should I Expect from Dermaplaning? Dermaplaning is generally performed on the face and neck, and is usually a fairly quick procedure, lasting 20-30 minutes. Your skin will be cleansed and dried, and no anesthesia is necessary. After the procedure, some patients report their skin feeling dry or having some redness, but that usually resolves quickly on its own. You can resume normal activities immediately following the dermaplaning treatment. Dermaplaning is not typically effective on keloids, deep wrinkles, deep acne scars or stretch marks. How Much Does Dermaplaning Cost in Jupiter, FL? Costs vary with each individual, depending on which treatment is chosen and a variety of other factors. Cost of your treatment is thoroughly discussed during your consultation with Dr. Barrett. We do our best to keep things affordable for our clients by offering complimentary consultations, as well as several options to pay, including cash, check, credit card and CareCredit® financing. To find out more about dermaplaning or any other skincare treatment at Renu Medical Aesthetics, contact our office to schedule a free consultation. We proudly serve men and women in Jupiter, Port St Lucie, Tequesta, Palm Beach Gardens, and neighboring areas in Florida.